,” to review. Do you know Shanna and Tim, of Food Loves Writing? Not only do they create beautiful recipes on their site, but the writing is fantastic and poignant. I highly suggest you skedaddle over to their blog as soon as you’re done reading more about this amazing pizza crust that comes straight from their new book. Before delving into this book, I’d never really heard of einkorn, much less baked or cooked with it. But it’s kind of awesome — not only is the ancient grain easier on the belly in terms of digestion (including those with gluten sensitivities), but you can enjoy it both in whole berry form or in flour form. The sweet flavor and silky texture of the einkorn lend themselves well to anything from vegetable quiche, kale salad, cinnamon buns, breads and cookies — all of which are recipes found in the cookbook, by the way. I might be drooling just thinking about them, I don’t know. (though word on the street is it’s becoming easier and easier to find in local coops and grocery stores), I got to work on my pizza eating week I mean, pizza research week. Of course. 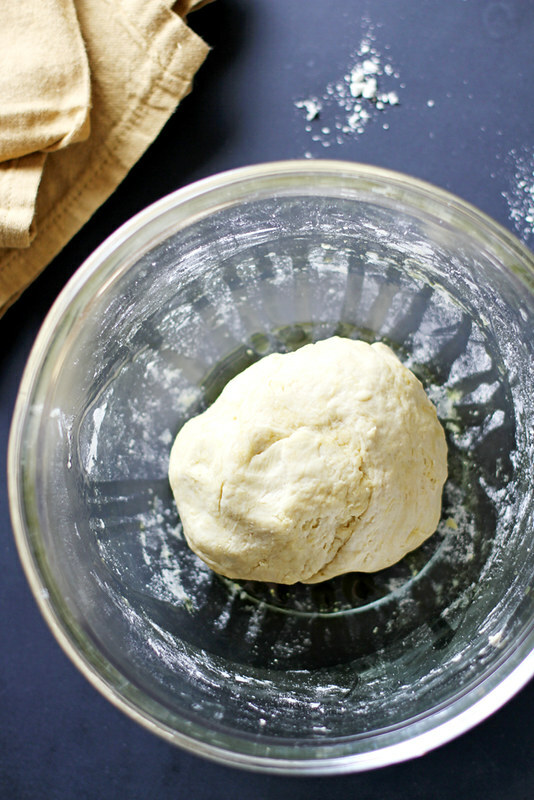 Here is what I love about this pizza crust: Um, it’s EASY. Like, you mix some stuff in a bowl, cover it with a towel or plastic wrap, and let it sit for about an hour. You’re not really waiting for it to double in size like with most pizza recipes, but just so it gets a little puffy. Then you press the dough super-duper-thin (about 1/4-inch thick I’d say, so way thinner than the photo below shows) onto a sheet of parchment paper, top it with all the toppings you could ever desire, and bake it for 12 to 15 minutes. That is all. And the result is a perfectly crumbly, flaky and ever-so-slightly chewy crust with a uniquely mild sweetness to it. It’s really the perfect texture and flavor for a pizza crust (most excellent call on that one, Tim and Shanna!). The edges get all golden brown and crackery, too, which I heart a million times over. And also ate a million times over. Below are instructions for exactly how I did up my pizza: Instead of two smaller pizzas as indicated in the book, I just made one gigantor pizza. 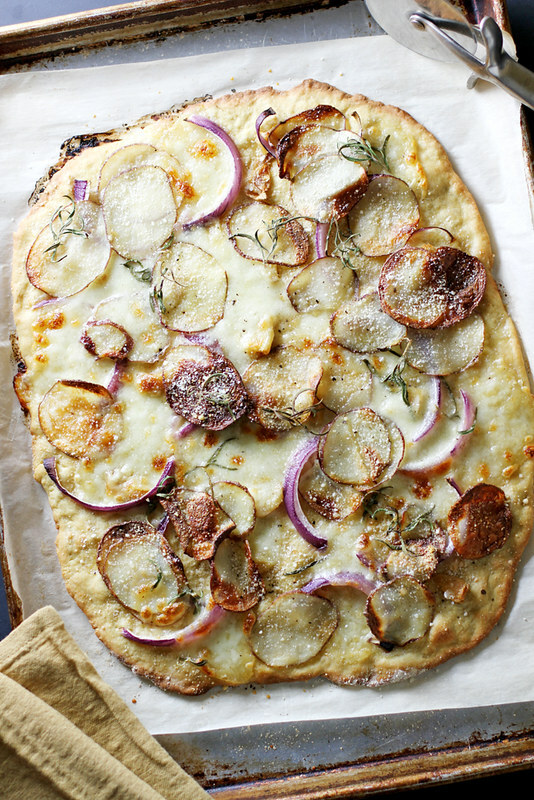 I topped it with a brushing of olive oil, roasted garlic, sliced red onions, fresh mozzarella, thin-sliced roasted red potatoes, fresh rosemary leaves and a sprinkling of Parmigiano Reggiano. But I can also see the flavor of this crust pairing deliciously with red sauce and pepperoni, or barbecue sauce and chicken, or strawberries and leeks with a balsamic drizzle (which is actually a suggestion/recipe in the book!). Anything goes, really. All you need to worry about is getting enough slices into your pie hole. Good thing the crust is uber simple to make, in case seconds are in order. So when I say “Impromptu pizza party at my house!” you say “Be right over!” and we’ll all make einkorn pizza crust together, OK? 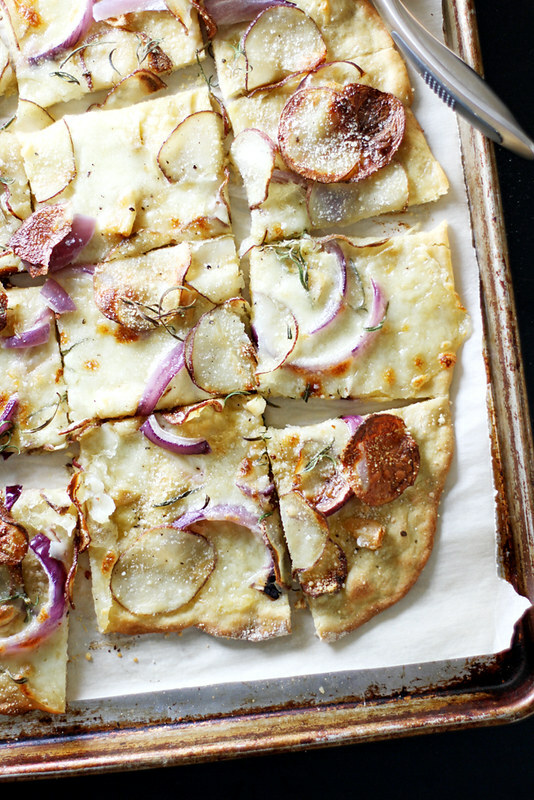 Also, homemade potato chips on pizza = I need to do this in my life forever and ever. 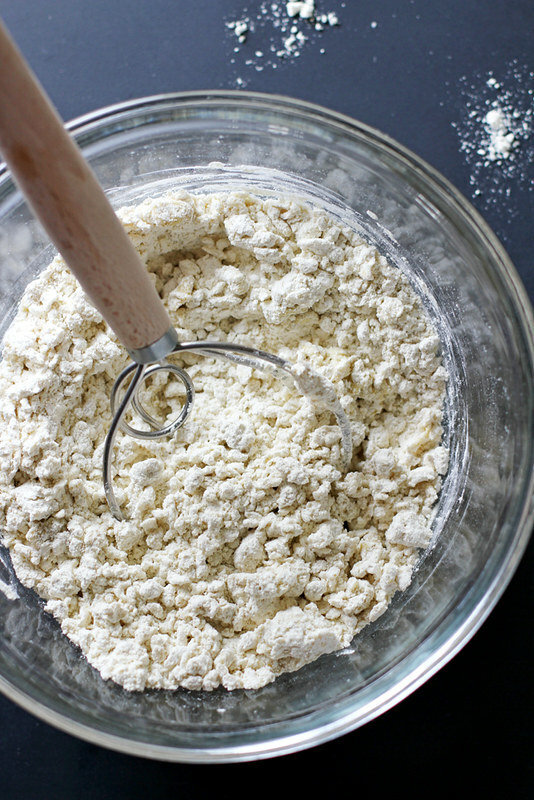 In a large bowl, combine 2 cups (or 250 g) einkorn flour, olive oil, sea salt, yeast and kefir with a wooden spoon or dough whisk. Stir in warm water, then use dough whisk or your hands to knead dough together into a ball, adding more flour (up to 1/2 cup) or warm water (up to 1/4 cup) as needed. Drizzle oil in bowl, then place dough in bowl, turning once to coat. Cover bowl with plastic wrap and let rise in a warm place for 1 hour (dough will not double, but it will get slightly puffy). Meanwhile, heat oven to 400 degrees F. In a large bowl, toss sliced potatoes with olive oil, salt and pepper. Spread in a single layer on a baking sheet. Peel away as much of the outer skins from the garlic bulb as you can, keeping the bulb intact. Slice off the top 1/4-inch to expose the cloves. Place bulb on a small piece of foil; drizzle very lightly with olive oil and sprinkle with a pinch of salt and pepper. 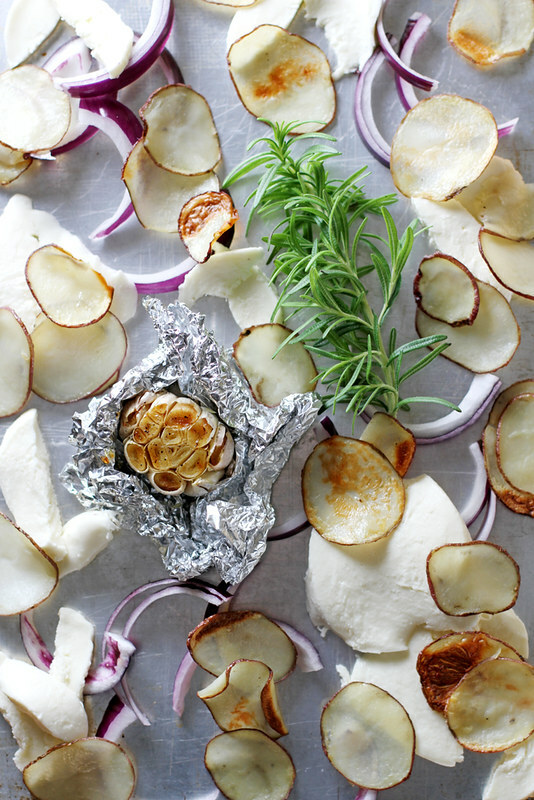 Cover completely with foil; place bulb, cut-side up, on baking sheet with potatoes. Cook potatoes and garlic 30 to 40 minutes until potatoes are just crisp and garlic is roasted. When dough is ready, heat oven to 475 degrees F. Line a baking sheet with parchment paper; lightly sprinkle with flour. Press and stretch dough on prepared baking sheet until really thin (you can divide the dough into 2 pizzas, too, if you want). Brush top of dough with olive oil, then top with roasted garlic, sliced mozzarella, roasted potatoes, sliced onion, fresh rosemary leaves and a generous sprinkling of Parmigiano Reggiano (or whatever toppings you desire). Bake pizzas 12 to 15 minutes until crust is golden brown on the edges and cheese is melted and bubbly. Cool 5 minutes before slicing. Disclosure: I received a copy of “The Einkorn Cookbook” for review purposes only. All opinions are my own. This post contains affiliate links. I’ve never heard of einkorn, but now I’m super intrigued and I’m off to read more about it. This pizza looks gorgeous. I love potatoes on pizza. Doubling down on the carbs is always a good thing! Steph, YES to this cookbook and an even bigger YEASS to those toppings you put on that pizza. Sounds like a dream – and something I’m making ASAP! I am always always always up for pizza night! This reminds me of the Boise pizza from Pizzeria Lola which I had LAST NIGHT and it was sooooo good! Potatoes on pizza + genius. Every week could be pizza week for me.. 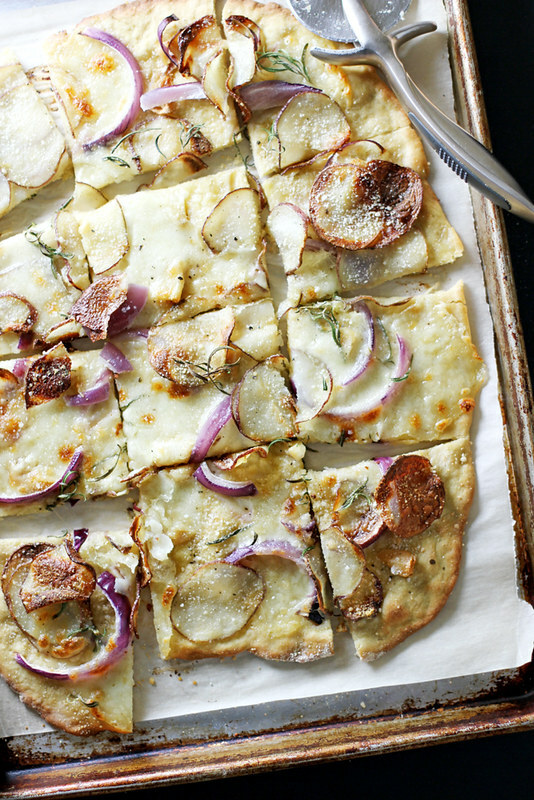 Thin crust is always my favorite so this one looks dreamy. I love find out about new flours! I have tog et myself a cop of this book and make a my self a double carb pizza, Love it Stephanie! Multiple pizza nights sounds pretty good to me. Loving this crust and those toppings! Totally trying this ASAP!! And I love the way your mind thinks. Multiple pizza nights? YES!!! This looks fabulous! Perfect to serve at a get-together. I still have a bag of einkorn flour in my pantry, so I may make this soon! This is such a unique pizza. I have never seen one like this before. It looks amazing. Sini — Yes, it’s great for get-togethers (or for just me and myself? ;))! 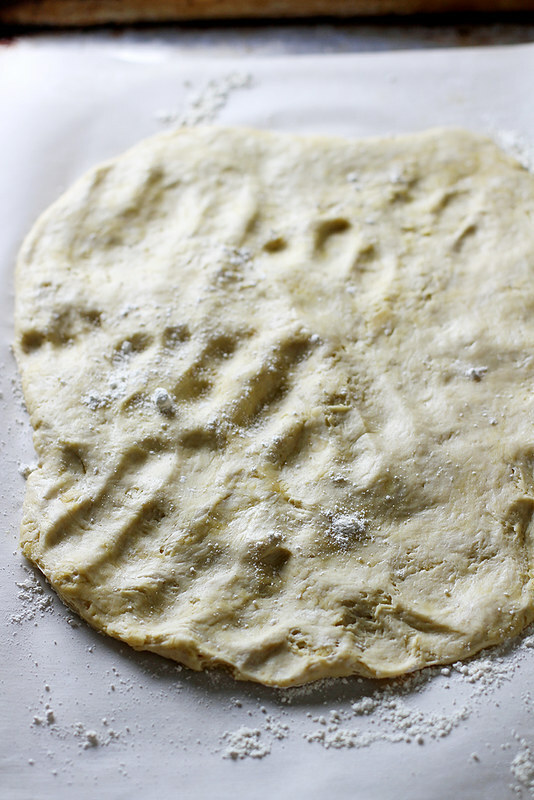 You definitely should use some of that flour for this pizza crust — you’ll love it. Oooooo I love finding new healthy ingredients to lighten up all my fattening favorites. And those crispy potatoes and rosemary?? Ahhhh love. What an awesome cookbook! 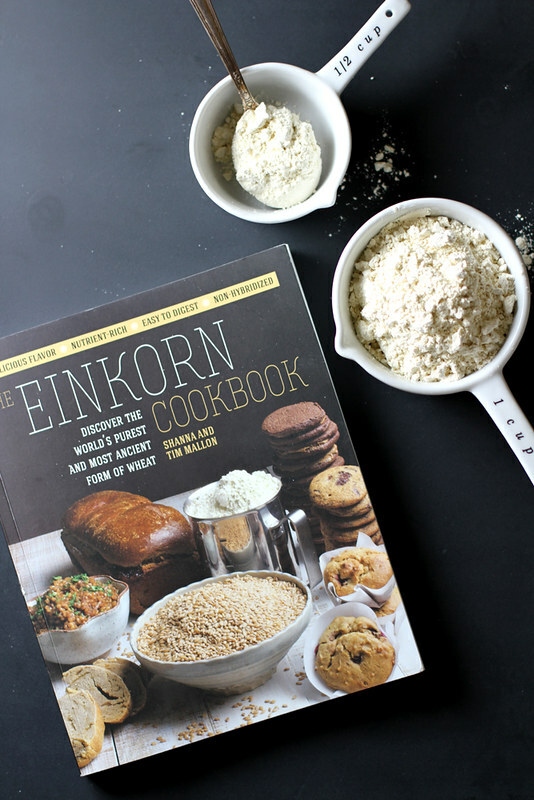 My mom uses einkorn all the time, and I bet she would flip her lid over this cookbook! I’m texting her right now! This ultra thin crispy crust looks magnificent and I luuurve your choice of toppings. I’d love to make this pie on Sunday and all the days. Thanks for informing me about Shanna’s new book! Absolutely love this thin and crispy crust pizza. Not to mention those toppings. This sounds delicious. I’m dying to try some of this einkorn flour!!! Potato pizza is my favourite moreish treat! Yum!! Thin and crispy pizza crust is the best, what a beauty this is! I’ve have been looking for a thin crust pizza dough recipe in an attempt to recreate a local pizza flavor! This looks delicious! 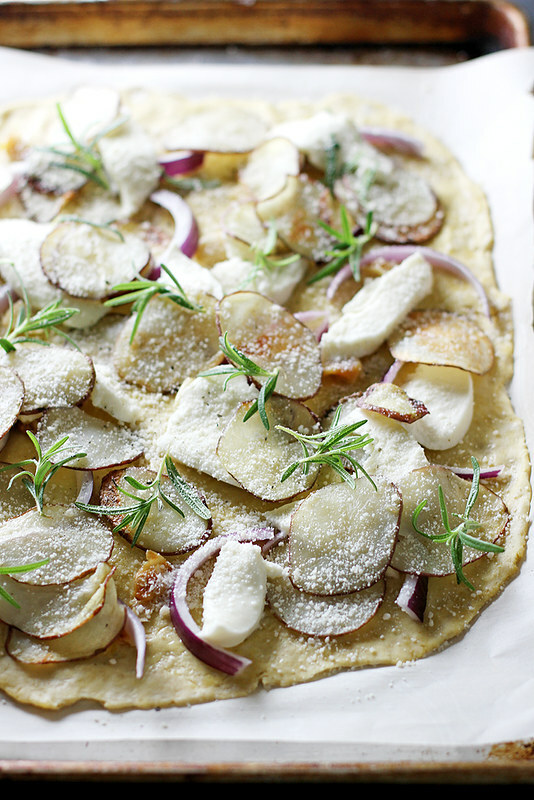 Potatoes and rosemary on pizza can’t be beat! I had a pizza in Chicago that also had a couple of fried eggs plopped on top of the crispy potatoes–so good! The Pioneer Woman first taught me to put potatoes on pizza. And I never looked back! This recipe sounds amazing! I can never eat too much pizza! This crust looks so crispy and delicious! I think we need to have a pizza week! Love the unique flavors of this pizza! I’ve never had einkorn flour before, but now I’m so intrigued, especially considering how deliciously thin and crispy that crust looks! My favorite pizza from when I was a kid has these same toppings – it’s sounds like an odd combination, but it’s SO good! Woah, I had NEVER heard of einkorn before this. I want to do more research on it! It’s interesting that it works in so manyer cipes too. I’m so intrigued!! Interesting…I’ve never heard of Einkorn before, but now I want to find me some 🙂 Love the looks of this pizza, I’ve always loved a thin crust, and potatoes, rosemary…yes pleeease! I love Tim and Shanna’s pizza crust – it’s my go to recipe and I’ve made it with all sorts of flour. Your toppings sound so good too; I love potatoes on a pizza. So creative and delicious! Potato chips – I know some folks (ahem – my son, and me, ok?) that would devour this baby! Yum! Homemade pizza is the best and thin crust is one of my favorites. Well you can’t argue with a no knead pizza crust. I love making homemade pizza. Most of the time they are waaaaaaaaaay more interesting and delicious and creative in flavor combinations than you can normally get in a pizza parlor. I’m a huge fan of Einkorn and am lucky enough to have a store or two close by where I can pick it up whenever I want some. Thanks for this great explanation of a pizza crust recipe, it’s Father’s Day today, and my kids got me a new pizza peel, so it looks like pizza night outside on my Big Green Egg, einkorn flour dough of course! so when you say “knead into a ball….”, how much kneading are we talking about? With einkorn flour less is more, but I don’t want to knead the dough too little (wouldn’t that affect the texture as well?). Any suggestions would be greatly appreciated. In my experience, pizza dough’s can be finicky. I just made the dough, i added herbs n spices to the dough. Let it rest 35 minutes, then played with it a few minutes til smooth n silky, then let it rest again, (in warm place). It rose just enough, you know, the way thin pizza crust should. I played with it for bit more, rolled it out somewhat, rolled up the edge, (next time will put a bit of cheese in that roll) and put our toppings on it, homemade barbecue sauce, mushrooms, fresh spinach, baked spiced/herbed chicken, a few surprise jalapeño, and cotija, mozzarella and irish sharp cheddar ?. Just a wee bit of each one. This crust though! The rolled up edge was soft n chewy, and the thin bottom perfectly crusty! We will use this again! Thanks for posting! Ps…i do use einkorn always! I love it, the texture, the smell, the way it plays so nicely.